In our hectic world, many of us deal with sleep troubles. We toss and turn thinking of long to-do lists and looming deadlines. Tense, achy muscles make it hard to sleep. Why use sleeping pills when there’s a better way? 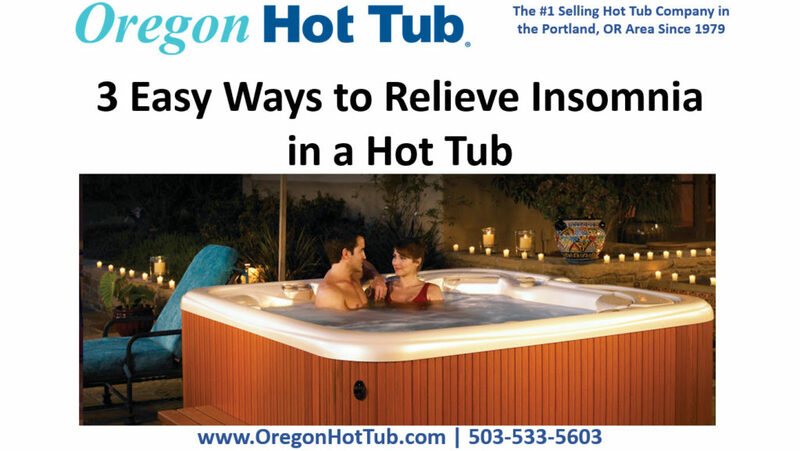 Here are 3 ways to relieve insomnia in a hot tub. Melt Away the Stress – A hot tub’s massaging jets combine water and air to release a soothing stream that loosens tense muscles. Massage targets muscles as the body releases mind-relaxing endorphins, soothing away stressful thoughts. In the end, a happy mind lends to a sound sleep. Massage Away Muscle Aches – A hot tub’s customizable massaging jets, heated water, and buoyancy help you relax while targeting muscles in the back, neck, and shoulders. Just 15 minutes in a hot tub relaxes your body, helping you find a comfortable position to slip into a restful sleep. Create the Right Body Temperature for Deep Sleep – A relaxing soak in the hot tub raises core body temperature. Then, when you get out of the tub, your body works hard to cool itself. This process leads to nighttime calm, easing you into a deep, restful sleep.